It was a delightful sunny Saturday afternoon in Rome, following a bit of a dreary, but relatively warm morning. After lunch my friend Jenna and I decided to enjoy the nice weather with gelato in a park. We went to one of my favorite parks I’ve seen so far, Piazza di Santa Maria Liberatrice in the Testaccio neighborhood just across the river to the south of Trastevere. The neighborhood is relatively small, sandwiched between the Tiber to the west, the Aventine Hill to the east and Monte Testaccio (Rome’s ancient Mount Trashmore) and old industry to the south. The area was sparsely populated with poor rural settlements before the mid to late 19th century when it was developed for worker housing for the industries nearby. It is one of the few cases of planned urbanization in Rome. Laid out in a grid system, the neighborhood has a sense of continuation within and with the rest of the city, despite actually being somewhat tucked away. The regular streets disguise the neighborhood’s small size, giving a sense it could continue endlessly. It is characterized mostly by 6-8 story apartment buildings with sidewalk level shops, a market building, one large early 20th century church Santa Maria Liberatrice, and of course its associated piazza. Piazza di Santa Maria Liberatrice is really more of a park compared to a typical Rome piazza. It is two blocks long and triangular shaped with a large playground at the wide end and a large open plaza in the center that flows into a brick pathway lined with benches leading to the narrow end near the church. The entire piazza is filled with trees and areas of green. The few actual grassy areas are separated by small grade changes with brick retaining walls and benches, discouraging walking there, so they have actually been maintained pretty well compared to most places with grass in the city. 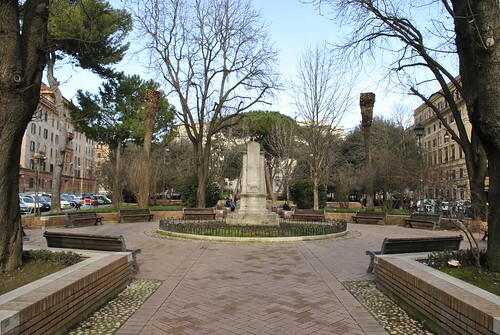 The abundance of trees and breaking up the piazza with different elements create several smaller spaces instead of one single open space which is more typical of Roman piazzas. This makes the piazza much more versatile and useful for more and different people. The scale and aesthetic of the buildings surrounding the piazza provide a well defined edge around the urban space. After we got our gelato from a place at the corner, we took a bench in a nook between the playground and the larger central plaza. The playground was very active today with several children and their parents out enjoying the nice weather. Across from us three old men were sitting and shooting the breeze over a smoke. Soon several of the local pigeons congregated around us as we were finishing our cones. I laid a few crumbs down near me to see how close they would come. One little guy in particular was trying to get closer but kept beating around the bush. A small lonely sparrow came out from his hiding spot under a bush so I threw him (or her) a piece. Later on a few boys started of a game of soccer in the central plaza space – the biggest kid as the goalie. Meanwhile the old men went on their way and a new crew took their place. The mini world cup was a fierce match but all in good fun. When the ball went astray there was plenty of help getting it back. A middle aged man sitting on the bench next to us tossed it back first. Then a young father passing through with his daughter in an all-terrain stroller kicked it back to them. The next foul ball went high into the air right towards the new group of old guys. I can only imagine the brief terror those kids experienced as the ball went hurling through the air towards them. But the men shrugged it off and all was well. It was a captivating game that got everyone involved. The interaction of different people, different generations, and different creatures makes visiting this park a wonderful experience. It is a park that encourage and facilities an endless number of activities through its design and amenities like the playground and ample sittable space. The different spaces within it are at a human scale, making them inviting and comfortable to be in. The buildings and church that frame the park give it context and a sense of place, making it special and unique to that community. Piazza di Santa Maria Liberatrice is everything a great urban neighborhood park should be – and a great place to enjoy the day with some gelato. Neighborhood Network News has posted video of last Saturday’s (Jan 23) “Imagine a Vital Neighborhood” urban design conference in Cedar Rapids. Architecture students from Iowa State University’s Bridge Arch 601 Graduate Studio presented design proposals and strategies for sustainable redevelopment in Oakhill Jackson and New Bohemia. I haven’t watched the videos entirely yet, but there were a range of ideas from more abstract and statistical to more specific design proposals. One intriguing idea was very ambitious, proposing a residential high rise and retail complex including a Target store – on par with mixed-use urban big box developments found in several larger US cities. 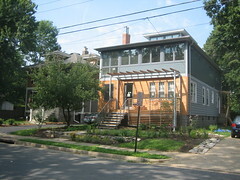 A common theme was to reuse building materials (like from Farmstead) for new construction in the neighborhood. The videos are definitely worth a watch. Special thanks to Robin Kash for posting these and other community meeting videos on Neighborhood Network News. Today we had another intriguing lecture for ARCH 528 as well as a walking tour discussing the contemporary history of Rome in connection with the modern republic of Italy. Rome became the capital of the unified Italy on December 20, 1870, likely chosen for its symbolic history as a center of power and government. At the time Rome was not much larger than the original ancient city and had somewhat of an agrarian economy. Expansion and transformation from a sleepy town to once again major urban center occurred very rapidly. Modernization had to be quick so many existing buildings were taken over for government use and to house various ministries. The biggest issue was housing to accommodate the extraordinary growth. Rome was a city of employees, not industry, but construction of course boomed. Surrounding landowners – monasteries and aristocrats – were now developers and there was a building fever. New buildings were eclectic with historical references on facades. A typical new building – becoming common across Europe – was four or five stories tall with all commercial space at ground level. Above on the first floor were located larger, luxurious apartments for the wealthy, and the upper floors became shorter and smaller for the lower classes. This is very interesting, seeming to be the beginning of planned large-scale mixed-use buildings. In general the ancient part of the city was and is still mixed with residential and commerce, but it was much more organic and reactionary. So much of the city of Rome is not of ancient or even medieval times, but of the 19th and even early 20th centuries. To accommodate automobiles, some new arteries were cut through historic areas. Corso Vittorio Emmanuelle II was cut through the dense Field of Mars area (in the thick of ancient Rome). Unlike new straight arteries, this one winds through to minimize destruction and curve around the most important buildings. Otherwise many building facades were cut back. This is still not a particularly wide street by any means, but is certainly an important traffic corridor through the middle of the city. To the east it connects to a new street, Via Nazione which was modeled after radical new radial avenues in Paris that accommodated not only traffic, but various infrastructures as well. And finally, close to home (studio) in the Jewish Ghetto, major changes also occurred. With striking parallels to the United States’ urban renewal of the 1960s and 70s, whole areas were deemed unfit and demolished to build brand new. A large part of the ghetto, which had been extraordinarily dense was removed and laid over with a modern grid – including the new synagog. The whole area replaces resulted in only four blocks so the juxtaposition against the remaining ancient urban fabric is quite unusual. (See blue blocks on map above.) At one place you can stand in between the ancient ruins of the Portico d’Ottavia, tiny medieval buildings, and large scale block-sized buildings in simplified Renaissance style facades. While walking around we used Nolli‘s 1748 figure ground map laid over what exists today to understand the great extent to which some places have been altered. 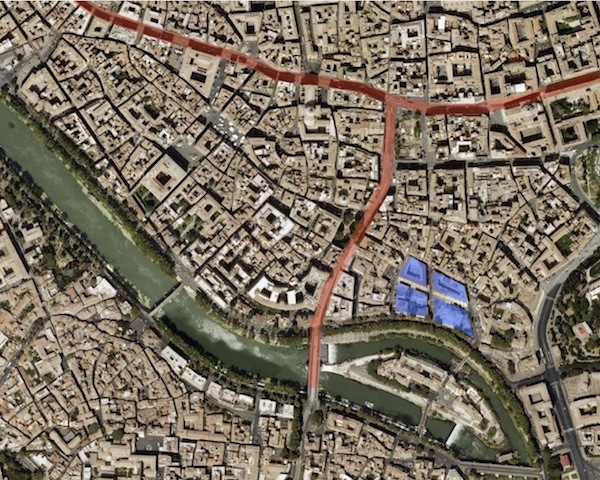 Above the map diagram shows the Corso Vittorio Emmanuelle II artery cutting through the center of Rome (horizontal red line) as well as Via Arenula (north-south) which turns into Via di Trastevere south of the river crossing. It of course terminates at Vittorio, but there was a plan to extend it even further north and split along either side of the Pantheon (located just a few blocks north, off the map). In that proposal, the Pantheon was deemed important enough to preserve, but of course dozens of buildings around it did not have that esteem. Thankfully this extension did not occur. Additionally on our walking tour, we visited the Palazzo D’Esposizione museum, located on Via Nazione, completed in 1882, so the new state could show its interest in art and culture. There was a new, essentially all glass addition on the back containing a cafe and restaurant. We stopped here first before visiting the gallery, which was seemingly entirely separated (we actually had to go outside and reenter the front of the building). Currently there is a large exhibit with the works of Alexander Calder, who is best known for his mobiles and large (often red) stainless steel sculptures. A group of school children tried to make one of the large mobiles move by blowing at it from afar. How fun. Post for Friday, Jan. 8, second day in Rome. It was cloudy in the morning and lasted the entire day before a hard, but relatively brief rain. I have not really taken any photos yet due to the potential for rain today, and not wanting to look like a total tourist as I still try to orient myself in the maze of inner Rome. I started my day later than usual and went we a half a dozen others to get cellphones. At the TIM store we met several other students from America, some from Dartmouth and some from Cornell University. For lunch we ate at a pizza place nearby. They have a variety of kinds of pizza, smaller in size, and cut off the amount you request. The cost is determined by weight. I had half a pizza, about the size of a very large slice, for €3 and a bottle of Nestea for €2. To get to the cellphone store we crossed the Tiber River to the north through a fine shopping district to a major road called Corso Vittorio Emanuele II. (I haven’t even began to try to remember street names.) There were several shops and restaurants in this area. In front of a McDonald’s (the only recognizable chain anything I’ve seen so far) there were some young boys smoking. On our way back through the narrow vias we stopped at a household goods store for towels (salviette). No luck so we returned to the apartment. At this point it was near 5:30pm or so. Crossing the bridge we ran into two others, who I continued on with to a supermarket. The supermarket, Panella is on our side of the river on Via Natale Del Grande (street). To get there we walk from our apartment along Via dei Genovesi, another very narrow alley street, about a five block distance till we hit the major road Viale di Trastevere, that crosses the river and has a tramline running down the center. 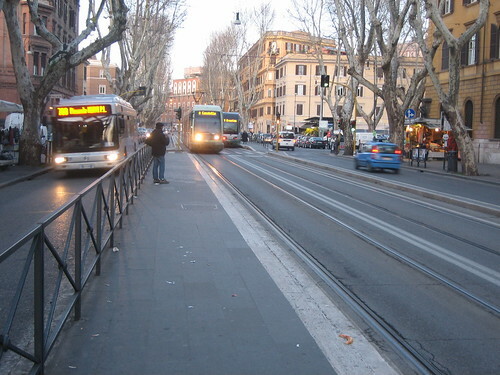 From there we cross and walk down about two blocks until Via Natale Del Grande, which is opposite from a piazza. The first block of Via Natale Del Grande is wider and limited to pedestrians and is tree lined on both sides. There is an art supply shop along this block. The next block with Panella is much narrower and open to cars. Of course the street is used for much more than that. The sides are full of parked scooters, compact cars, and several portions are built out with patios for restaurant dining space. The supermarket was very subtle from the outside, as most shops seem to be. The front is very small and contains only a few checkout lanes. Like a supermarket we stopped at earlier near Corso Vittorio Emanuele II, it was made up of several smaller rooms and spaces connected to each other, but probably nearly twice as large. I bought some bread, prosciutto, cheese, some generic Italian cereal, and a liter-and-a-half bottle of Ben Cola for a little over €8. My first “self-prepared meal” here was a sandwhich and cola. Later this evening a friend Jamin and I went out exploring in the general direction of the Colosseum, not too far from our apartment across the river. We did not take the most direct route, but as always interesting. It was not quite as large as I had imagined, but certainly impressive. Our roundabout exploration ended up being a little under 4.5 miles, or a little over 7 km. (see route here. There’s so much of Rome I have yet to see and many famous sites I haven’t even thought of yet. Tomorrow is Saturday or Sabato and I look forward to spending another day exploring, maybe even take some photos. I’d like to do some map sketching and some digital diagrams, but likely won’t get to that in the next few days. I believe mapping and spatial drawing will be a major focus of our first few weeks of study, which begins Monday. Rome is certainly a city where maps are critical. Above is a quick mapping diagram I made for a group case study project a few weeks ago. 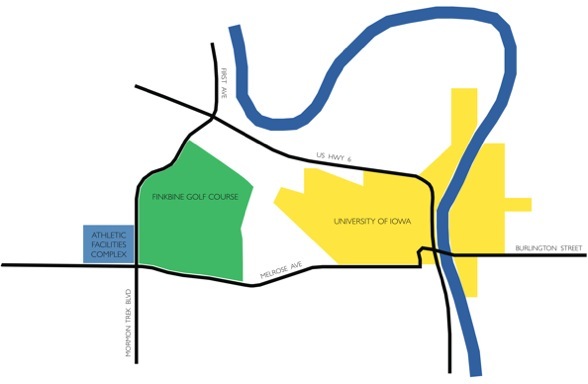 It describes the relative size and location of our case, the University of Iowa Athletic Facilities Complex to the rest of campus and within the larger municipality. I find representation and diagramming of spatial relationships and place very interesting. By simplifying and abstracting existing space, certain qualities may be presented more clearly than if presented so literally. I returned last Tuesday from a week in the Washington, DC, area. My friend Cece and I went to visit another friend Spencer, who goes to school there. This was my fifth time to the nation’s capital, while it was Cece’s first, so it was a good mix of seeing different neighborhoods and the obligatory museums and monuments. We flew into BWI Wednesday, Aug 5, and took the MARC Penn Line to Union Station in downtown Washington. All previous times visiting I’ve flown into Reagan National Airport, which is literally across the river from DC, in Virginia. It has Metro service on the Blue line so getting into the city is a breeze. From BWI, we first had to take a shuttle bus to a remote parking garage where the MARC stop was at. Then we waited about twenty minutes for the train; meanwhile a few Amtrak Acela trains zoomed through. It look 30-40 minutes to get to Union Station in DC. Our first day was spent just walking around downtown and the Mall area. The next two days, Spencer had reserved a Zip Car, so we ventured into Maryland and Virginia, far beyond the Metro lines. On Thursday we drove to Annapolis and spent a few hours exploring the historic capital city and enjoyed a delicious lunch at a local seafood restaurant, Backyard Bar & Grill. Annapolis is a beautiful place with brick everywhere. The scale and density of buildings in the city’s historic center is so unusual compared to what is typical in much of the country, particularly outside the east coast. On Friday we went to Shenandoah National Park in Virginia, where we took a nine mile hike up Old Rag Mountain. Saturday morning we spent a couple hours at museums and the National Mall. In the afternoon we had a corn party grill out at a townhouse in Georgetown where a friend of Spencer’s was getting ready to move out of. It wasn’t “Iowa sweet corn from the back of a pickup truck” but it was good nonetheless. On our walk back to GWU, we passed through the new Georgetown Waterfront Park, along the Potomac River that most recently was used for parking lots. It was refreshing to see a modern, urban park in Washington, where most public spaces are decidedly more formal. That evening we went to a Nationals Game at their brand new stadium on South Capitol Street by the Anacostia River. I’m normally not a huge fan of baseball, but I enjoy the atmosphere and it was neat to see the new stadium. The area surrounding the stadium is undergoing intense redevelopment with a number of new, large office buildings replacing mostly run-down housing. Sunday was spent visiting a few other museums including the Renwick Gallery and the National Portrait Gallery, neither of which I had been to before. The Renwick, sitting at the corner of Pennsylvania and 17th, just across the street from the White House, had a delightful collection of American folk art. At the National Portrait Gallery I enjoyed seeing the infamous presidential portraits and WPA era paintings. 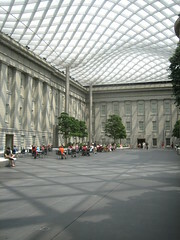 In the middle of the museum is an enclosed courtyard (see image to left) with a beautiful undulating glass and steel ceiling. Designed by Norman Foster and constructed in 2004, it reminded me of the Great Court at the British Museum in London, also designed by Foster. Despite being an extremely hot day outside, inside the courtyard was very comfortable. With a cafe and lots of seating it would be a pleasant atmosphere to have lunch or meet someone for conversation. That afternoon we took a walk around the neighborhood of Capitol Hill, stopping by the recently reopened, historical Eastern Market which was severely damaged by a fire in 2007. Inside the building is mostly meat counters and perishables, while other market vendors set up along the exterior and a parking lot across the street. The market was closing up for the day, but I managed to get inside behind two other explorers to see the refurbished space. We then headed further east along residential streets. Away from Pennsylvania Avenue the neighborhood is almost entirely residential, with a few corner stores, laundromats, etc. every here and there. Nearly all the housing here is in townhouses, mostly attached. Unlike older neighborhoods like Georgetown and remaining houses closer to downtown, this area had a little more room to breath. On many streets the houses were actually set a good distance (10-25 feet) from the sidewalk so they had private front yards. We all agreed it would be a nice place to live. 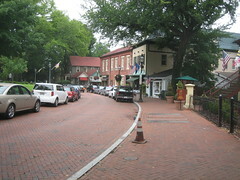 It has historic charm with strong urban qualities, but calm streets with tree shaded sidewalks. On our way back toward downtown we walked a few blocks north up to H Street NE, where rail tracks are being laid for one of DC’s new streetcar lines. 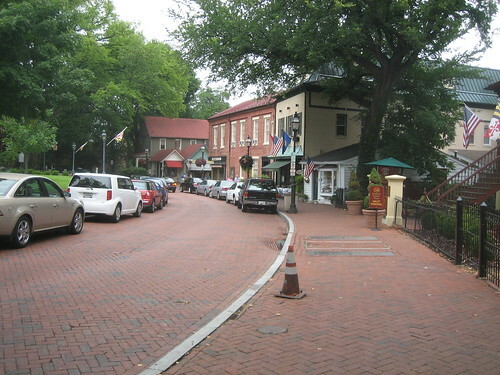 H Street is a wide, commercial street with a mix of large and small storefronts, some newer strip centers, and an unsightly public storage facility. Most businesses were gated up and closed for Sunday. Despite its seedy appearance, H Street is up and coming, and the streetcar line should help accelerate even more improvements. Monday morning I went on my own to explore the Rosslyn-Ballston corridor in Arlington. I took the Metro out to Ballston and then started walking. As walking around became tiring, particularly in the 90 degree heat, I grew apathetic to explore much more. The massive extent of metropolitan sprawl here clearly can not be comprehended with one week visiting and walking around. Outside of the District, the non-gridded, non-contiguous urbanized region goes on for miles. There are many instances of urban form outside the city, some new and artificial, and some long established. It is a very different scene than metropolitans, large and small of the midwest. Admittedly, I would love to be able to drive all around this area in a car just to get a better comprehension of what the many places and spaces in between are like. Looking at a map or even satellite images is simply insufficient to grasp, and one certainly could not see everywhere by transit either. Most of the large office buildings are clustered within 2-3 blocks to a few major thoroughfares. Despite wide, busy roadways there are wide sidewalks with decorative streetscaping, a good amount of pedestrian oriented ground-level businesses, and a general feel of real urbanism. In a couple places I strayed off the main road by a few blocks to see the “real Arlington” where large office buildings quickly transitioned into single-family residential. A lot of the houses were characteristic of mid 20th century East-coast suburban development, mostly with brick veneers in reverence to the more traditional Colonial Revival style. 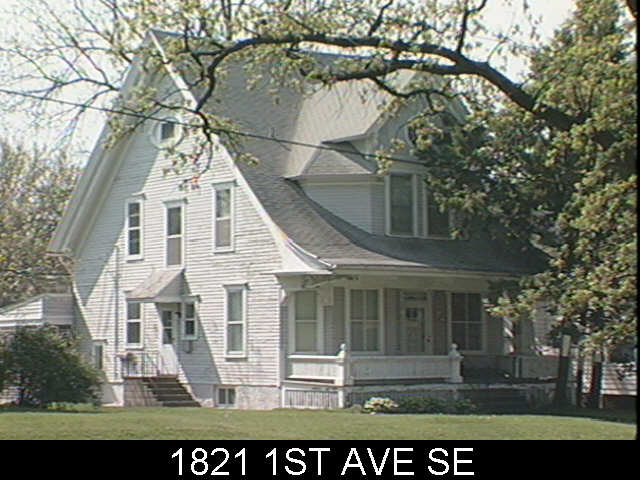 On other streets, though, homes were more characteristic of late Victorian and craftsman, that are common in older neighborhoods around the midwest. 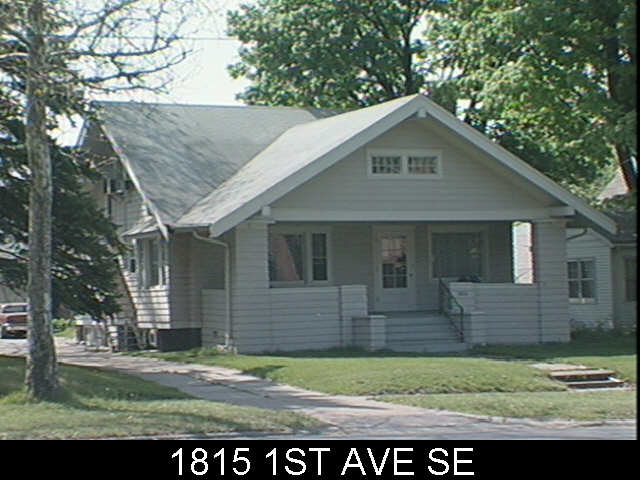 Some homes appeared to be renovated or possibly completely new, some keeping with the craftsman style, with others more contemporary, as pictured to the right. I met back up with Spencer around lunchtime, while Cece was spending more of the day visiting museums. We went up to U Street for lunch and continued walking north passing through Meridian Park, all the way to Columbia Heights Metro. The station is located by a major retail center on 14th Street NW. 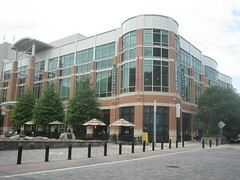 The DC USA development includes a Target store, Best Buy, Staples, and fitness club among other stores and restaurants. I have always found big box retailers in urban contexts very interesting, so this was fun the check out. Target seems to be leading with many urban stores around the country, and inventive architecture at their newer suburban stores as well. After this we hit up Silver Spring, another major “downtown” in the region, just outside the northern limits of DC. Silver Spring, along with Bethesda, is one of the shining stars of Montgomery County, Maryland. Amidst more single family housing, the urban business district merges subtly with surrounding neighborhoods. A major destination is “Downtown Silver Spring”, a former enclosed shopping mall that has been mostly redeveloped into urban blocks of retail storefronts. A plaza area and fountain on Ellsworth Drive, the mainstreet of “Downtown” acts as a centerpiece. But downtown Silver Spring is much more than this shopping mall disguised as authentic urbanism with many additional businesses, restaurants, and housing in new and old buildings. Near the “Downtown” shopping area, an open half-block lot had been artificial grass turf for a few years and was quite successful as public space, where people gathered and children played. I remember visiting the turf in 2007, and was surprised by how active it was. Now the site is under construction for a new Silver Spring Civic Building on the far end of the site with a Veterans Plaza in place. The plaza will act in many ways like the turf did, as a public space for people to gather informally and for events, such as the Silver Spring Jazz Festival. It should be noted Silver Spring is not actually an incorporated city and is governed by Montgomery County. There are few incorporated cities in Maryland’s Montgomery and PG counties that surround the District, but many places are considered towns or cities informally, such as Silver Spring. Tuesday, our last day in DC, we took a tour of the National Cathedral in northwest DC. It is an incredible building with several unique and characteristically American quarks. While most cathedrals were built hundreds of years ago, this one was only completed in 1990, after a long construction span of 83 years. Imagery and symbolism represent not only historic Christian stories and ideals, but also include modern elements of national and cultural significance. For example there is one stained glass window illustrating the solar system with a real moon rock brought back on Apollo 13. Also there is a discrete gargoyle of Darth Vader, expressing pop culture contemporary with the cathedral’s construction. The cathedral is not directly adjacent to a Metro station, so it afforded us a short walk through a quiet residential area from the Cleveland Park station to the east. The walk back was quite a bit longer with a missed turn on the way to the Woodley Park – Zoo station, one stop south of Cleveland Park, for reasons none other than to see something different than the walk there. Nevertheless it was interesting to see a less dense, yet undoubtedly stately residential area of Washington. When back to the Metro, we rode up to Rockville, a few stops out into Maryland. I was interested in seeing the Rockville Town Center redevelopment that commenced in 2004, to replace a long ailing shopping center that in a previous decade replaced the city’s original downtown in the name of urban renewal. Much of the mall was torn down, with parts of it remaining that include a row of restaurants and a movie theater, though it’s not obvious to the unknowing visitor that it used to be a mall. 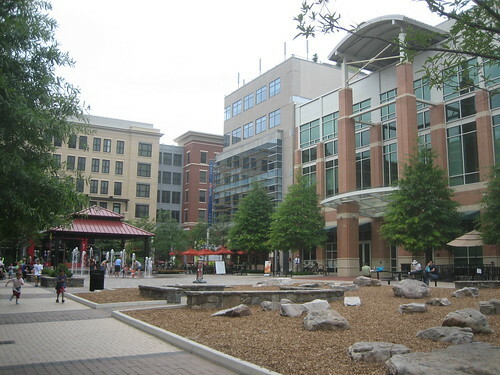 Phase 1 of the town center project was Rockville Town Square, a four block area that has been built up with urban-scaled buildings connected with the existing town street grid with a wonderful public plaza as its focal point. The view from the Rockville Metro station gives no indication of a walkable, welcoming urban space just a few blocks away. The Rockville Pike thoroughfare creates a minor barrier, along with a large, bland concrete office complex. A semi-enclosed pedestrian bridge over the road at least provides a safe means to cross on foot. We actually crossed the road on foot, not knowing exactly where the town square was, and passed the large office structure to where you could get a glimpse of something more humane and inviting. From our approach, we first came to the old mall remanence containing some restaurants and cinema, a block before the actual brand new development. I could tell this strip wasn’t as new as the town square developments. Across the street from the restaurant row is a large parking lot taking up the entire block. New buildings in the town square development were on the other side of the parking lot, so we headed in that direction. The actual Rockville Town Square plaza is surrounded by the new buildings, all around five stories tall, so it is almost hidden. The new buildings stand in pretty stark contrast with existing Rockville Buildings that are mostly bland concrete boxes and towers. One calmer city street goes right through the town square development, where it becomes much more decorative and pleasant. With relatively narrow street widths and buildings built up to the sidewalk, the town square is revealed and opens up as you approach it. The square was quite active today. There were a few restaurants facing the square with outdoor seating. Others were eating or just relaxing on one of the many benches and seats. Kids were playing in the fountain. We got burgers at a Five Guys and ate on one of the benches. Besides retail and restaurants, and of course apartments and condos on upper levels, a major tenant at the town square is the Rockville Public Library, also in a brand new building. The two-story library building is situated at the corner of the plaza next to the one traversing street. At the corner on the first level is a restaurant. The actual library entrance is on to the square. Inside is a large two story atrium with stairs to the second level. One exterior facade is undulating, giving the library a fun and modern aesthetic, standing out from the other more traditional looking buildings around the square. I really enjoyed visiting Rockville Town Square. Despite being brand new, it felt mostly like real city streets, real public space, not like a corporate “town center” shopping mall or completely separated New Urbanist development. With that, it felt a little hidden away behind larger, existing buildings and barriers like the Rockville Pike. Also since the town square is almost fully enclosed by new stylized buildings, it seems almost isolated from the rest of the actual city. But if this form of redevelopment continues I imagine it could provide a better connection between the square and surrounding neighborhoods. I look forward to visiting Rockville again someday. Overall another enjoyable visit to DC and surroundings, though my past two visits were in March, so I wasn’t quite ready for the extreme heat and humidity. I think DC would be a neat place to reside someday, so whenever I visit I try to see different places and experience what it could be like to live there. I like to see the different neighborhoods and different lifestyles they encourage, because the city is much more than monuments. See all photos from the trip on Flickr. By the way, the title of this post refers to this. A new 10,000 square foot, two-story professional office building is currently under construction at 1815 First Avenue SE in Cedar Rapids. 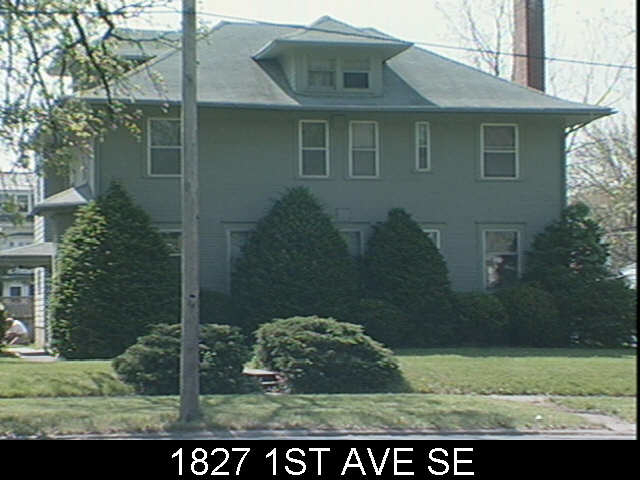 The development is replacing four former residential properties at 1815, 1821, 1827, and 1833 First Ave SE, all built between 1900 and 1921. 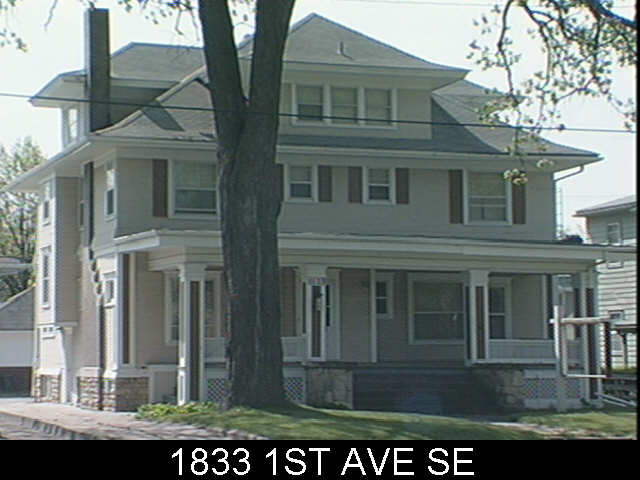 According to the Cedar Rapids Assessor’s records, these houses had all been converted into multi-tenant. None of these houses were in the best condition and understandably this area of First Avenue is very marketable for commercial use, so I’m not going to argue against the destruction of these century old homes, but the new use of the site is unfortunate. 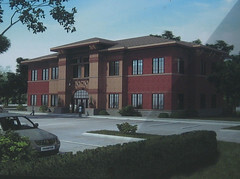 Above is a rendering of the finished building. It is fairly suburban looking, but two-stories is nice and the scale is appropriate. The building is set back from the sidewalk about the same distance as existing older houses and commercial buildings nearby. My only real problem with this development is how much of the site fronting the sidewalk has been used for parking. The site is approximately 250 feet long (along First Avenue) and maybe 150 feet deep. 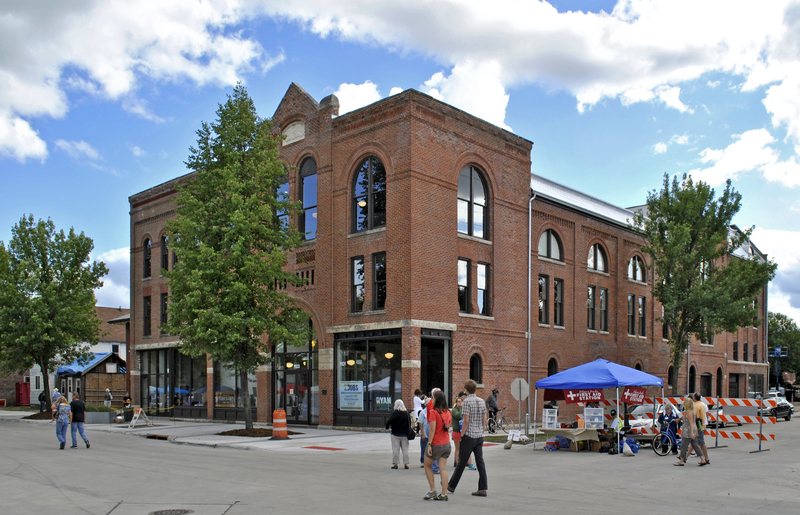 The building was constructed on one end of the site with the rest left open for a parking lot. If this type of new commercial development cannot survive without minimizing it’s parking requirement, or situating it more appropriately on the site, then perhaps this use does not belong here. I welcome reinvestment in this older part of the city – and especially diversification of uses, but it must be done respectfully and not diminish the urban quality that remains. 150 feet of parking lot along the sidewalk and the street is not progress, it is a gouge out of the former street edge that made this block pleasant to walk or drive down. Below are the four houses that were torn down for this development, not to mention tree fatalities. 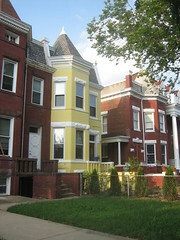 The images are arranged in the same order of the former houses. How long will this kind of auto-centric redevelopment go unquestioned?